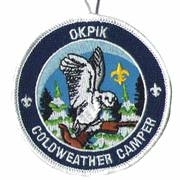 An official blue-colored Cub Scouts Web Belt (to attach adventure loops eventually earned). Kindergarten families will buy the "CS Lion Kit", SKU#632931 (which includes a Parent and Leaders Guidebook, a Lion Adventure Book, and a set of advancement stickers). The insignia on a Cub Scouts uniform is important to communicate his membership in his den, pack and council and to reflect the awards and ranks that he has earned. The positioning of insignia on the right and left sleeves and the right pocket of the official uniform shirt are the same regardless of the Scout's rank, or whether he wears the Cub Scout blue shirt or the Scouts BSA olive green shirt as a Webelos or Arrow of Light Scout. Those positions are shown below. The left pocket of a Cub Scout uniform is designed to demonstrate his current rank and other personal awards. For Lions, the left pocket doesn't include a patch. (It will in later ranks though). The illustrations below demonstrate proper insignia placement on the blue Scout uniform shirt.